SANTA ROSA, Calif. (January 15, 2015)—From the rocky coastline to the mountain vistas and the lush river valleys, the land has always been the hero in the story of Sonoma County. Through it all, the dedicated efforts of farmers and ranchers have been at the forefront of taking care of the land, protecting it and managing it in a way that has provided a bounty of apples, prunes, pears, poultry, lamb, beef and, more recently, winegrapes for nearly 150 years. With this in mind, Sonoma County Winegrape Commission, also known as Sonoma County Winegrowers (SCW), announced today it has created a 100-year business plan to preserve agriculture in Sonoma County well into the 22nd Century. The 100-year plan is believed to be the first of its kind in agriculture and the global wine industry. 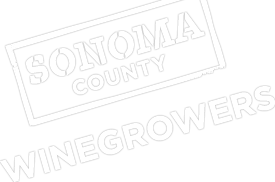 It is also the next step in the evolution of Sonoma County’s efforts to become the first wine region in the United States to have all of their wines grown and made in a sustainable manner. The existence of the 100-year plan was announced nearly one year to the day when Sonoma County Winegrowers generated worldwide attention for its bold commitment to become the nation’s first 100% sustainable wine growing region by 2019. Sonoma County winegrape growers are currently following a rigorous sustainability self-assessment and third party certification program focused on 138 farming and business practices, such as land use, canopy management, energy efficiency, water quality assessments, carbon emissions, healthcare and training for employees and being a good neighbor and community member. In the twelve months since announcing its sustainable intentions, the local wine industry reached one-third of its targeted goal of becoming 100-percent sustainable. More than 43% of (25,987 vineyard acres) of the county’s 59,772 vineyard acres have completed a sustainability assessment. In addition, 33% of the county’s vineyard acres (21,491 vineyard acres) have taken the next step and are now certified under a third-party auditor program. The 59,772 vineyard acres in Sonoma County only accounts for 6% of the county’s one million acres with the rest being utilized as pasture land (36%), forests (49%) and urban land (9%). More than 950 winegrape growers have attended sustainability workshops, meetings or other sustainability-related events. There were 26 sustainability workshops and meetings hosted by the Sonoma County Winegrowers in 2014. Eight of the county’s 16 AVAs held sustainability workshops in the past year. As the past year evolved, industry leaders met and the 100 year plan was written. It is designed as a living document and will be executed through both annual and five-year benchmarks that will identify transformational opportunities for collaboration and seek partnerships with a variety of groups including agricultural, business, community and education as well as government leaders to find tangible solutions and provide flexibility for the unexpected. The time period of 100 years was chosen as a natural period that touches everyone in a tangible way – it represents two generations before and the next two future generations in essence spanning from grandparents to grandchildren. The plan addresses such issues as innovation and research, natural resources, the regulatory environment, community engagement and marketing while building coalitions throughout the community in support of sustaining agriculture in Sonoma County forever.